Today's most sophisticated cybercriminals are increasingly bypassing traditional antimalware solutions and inserting advanced persistent threats deep within networks. These highly targeted attacks evade established signature-based detection by masking their malicious nature in many ways - compression, encryption, polymorphism, the list of techniques goes on. Some have even begun to evade virtual "sandbox" environments using VM detection, "time bombs" and more. Fighting today's attacks requires a comprehensive and integrated approach - more than antimalware. More than a virtual sandbox. More than a separate monitoring system. 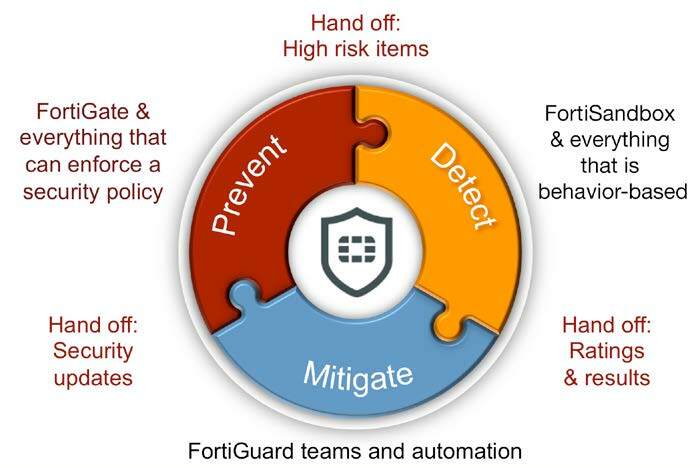 FortiSandbox offers a robust combination of proactive detection and mitigation, actionable threat insight and integrated and automated deployment. 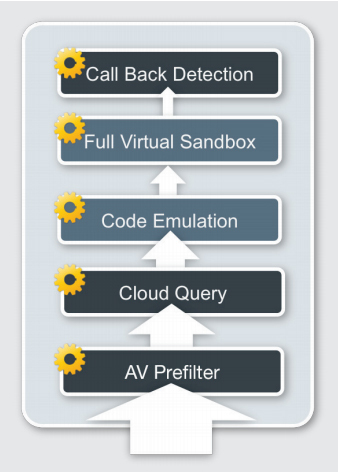 At its foundation is a unique, duallevel sandbox which is complemented by Fortinet's award-winning antimalware and optional integrated FortiGuard threat intelligence. Years of Fortinet threat expertise is now packaged up and available on site or in the cloud via FortiSandbox. Suspicious codes are subjected to multi-layer pre-filters prior to execution in the virtual OS for detailed behavioral analysis. The highly effective pre-filters include a screen by our AV engine, queries to cloud-based threat databases and OS-independent simulation with a code emulator, followed by execution in the full virtual runtime environment. Once a malicious code is detected, granular ratings along with key threat intelligence is available, a signature is dynamically created for distribution to integrated products and full threat information is optionally shared with FortiGuard Labs for the update of global threat databases. All classifications - malicious and high/medium/low risk - are presented within an intuitive dashboard. Full threat information from the virtual execution - including system activity, exploit efforts, web traffic, subsequent downloads, communication attempts and more - is available in rich logs and reports. 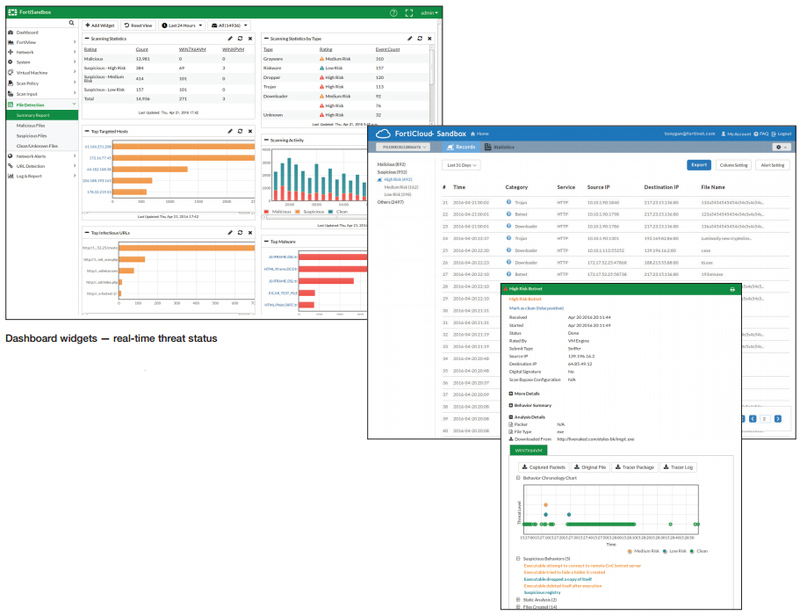 The ultimate combination of proactive mitigation, advanced threat visibility and comprehensive reporting. The most effective defense against advanced targeted attacks is founded on a cohesive and extensible protection framework. The Fortinet framework uses security intelligence across an integrated solution of traditional and advanced security tools for network, application and endpoint security, and threat detection to deliver actionable, continuously improving protection. Fortinet integrates the intelligence of FortiGuard Labs into FortiGate next generation firewalls, FortiMail secure email gateways, FortClient endpoint security, FortiSandbox advanced threat detection, and other security products to continually optimize and improve the level of security delivered to organizations with a Fortinet solution. Fortinet next generation firewalls, secure email gateways, web application firewalls, endpoint security and similar solutions use security such as antivirus, web filtering, IPS, and other traditional security techniques to quickly and efficiently prevent known threats from impacting an organization. FortiSandbox and other advanced detection techniques step in to detect "Zero-day" threats and sophisticated attacks, delivering risk ratings and attack details necessary for remediation. In a Fortinet solution, detection findings can be used to trigger prevention actions to ensure the safety of resources and data until remediation is in place. Finally, the entire security ecosystem updates to mitigate any impact from future attacks through the strong, integrated threat intelligence research and services of FortiGuard Labs. Complement your established defenses with cuttingedge capability - analyzing suspicious and high-risk files in a contained environment to uncover the full attack lifecycle using system activity and callback detection. Reports with captured packets, original file, tracer log and screenshot provide rich threat intelligence and actionable insight after files are examined. This is to speed up remediation and updated protection. Fortinet's ability to uniquely integrate various products with FortiSandbox offers automatic protection with incredibly simple setup. Once a malicious code is determined, the analyzer will develop and forward the dynamically generated signature to all registered devices and clients. These devices then examine subsequent files against the latest DB. Applies top-rated (95%+ Reactive and Proactive) AV Scanning. Serves as an efficient pre-filter. Periodically push dynamic DB to registered entities. FortiSandbox supports inspection of many protocols in one unified solution, thus simplifies network infrastructure and operations. Further, it integrates with FortiGate as a new capability within your existing security framework. The FortiSandbox is the most flexible threat analysis appliance in the market as it offers various deployment options for customers' unique configurations and requirements. Organizations can also have all three input options at the same time. This deployment mode relies on inputs from spanned switch ports or network taps. It may also include administrators' on-demand file uploads using the GUI. It is the most suitable infrastructure for adding protection capabilities to existing threat protection systems from various vendors. Various Fortinet products, namely FortiGate, FortiMail, FortiWeb and FortiClient can intercept and submit suspicious content to FortiSandbox when they are configured to interact with FortiSandbox. The integration will also provide timely remediation and reporting capabilities to those devices. 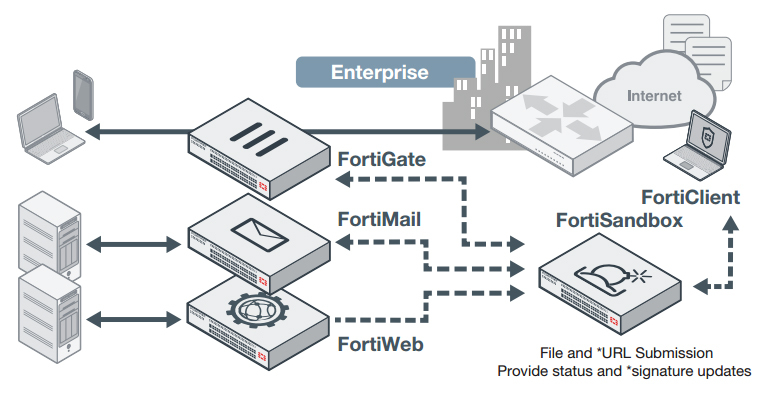 This deployment is attractive for organizations that have distributed environments, where FortiGates are deployed in the branch offices and submit suspicious files to a centrallylocated FortiSandbox. This setup yields the benefits of lowest TCO and protects against threats in remote locations. 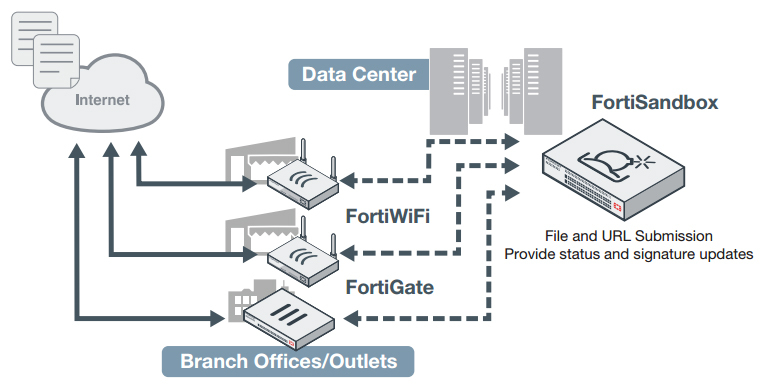 Download the Fortinet FortiSandbox Series Datasheet (PDF). Expands FSA-VM-BASE capacity by 1 VM. 1 Windows 10 license added. Expands FSA-VM-BASE capacity by 2 VM. 2 Windows 10 license added. Expands FSA-VM-BASE capacity by 4 VMs. 4 Windows 10 license added. Expands FSA-VM-BASE capacity by 1 VM. 1 Windows 8 license added. Expands FSA-VM-BASE capacity by 2 VM. 2 Windows 8 license added. Expands FSA-VM-BASE capacity by 4 VMs. 4 Windows 8 license added. Expands FSA-VM-BASE capacity by 1 VM. 1 Windows 7 license added. Expands FSA-VM-BASE capacity by 2 VMs. 2 Windows 7 license added. Expands FSA-VM-BASE capacity by 4 VMs. 4 Windows 7 license added. FortiSandbox Windows Cloud VM 1 Year Windows Cloud VM Service for (5) Windows Cloud VMs and maximum expansion limited to (200) Windows Cloud VMs per FortiSandbox VM. Minimum order quantity is 1 and maximum is 40. Note: Qty=1 is equal to one order of (5) Windows Cloud VMs. FortiSandbox Windows Cloud VM 3 Year Windows Cloud VM Service for (5) Windows Cloud VMs and maximum expansion limited to (200) Windows Cloud VMs per FortiSandbox VM. FortiSandbox Windows Cloud VM 5 Year Windows Cloud VM Service for (5) Windows Cloud VMs and maximum expansion limited to (200) Windows Cloud VMs per FortiSandbox VM.